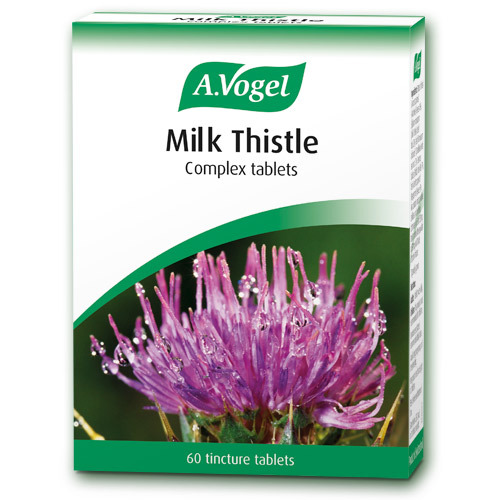 A Vogel Milk Thistle Complex Tablets are a blend of tinctures of Artichoke, Milk Thistle, Dandelion, Boldo and Peppermint. Used for liver tonic, detoxification, hangovers and fat metabolism. The main constituent of Milk Thistle appears to be the substance known as Silymarin, which is an unique function being able to act directly on the cells of the liver, producing a liver-protective effect. Silymarin is able to prevent liver cell damage through stimulating the function and regeneration of liver cells. All these factors are important in overall health, with the liver acting as the most important avenue for the elimination of toxins found within the body. Also available in tincture form. Extract of fresh Cynara scolymus* (Artichoke) leaves 46%, Silybum marianum (Milk Thistle) dried fruit 32%, fresh Taraxacum officinalis* (Dandelion) herb and root 12%, Peumus boldus (Boldo) dried leaf 7%, fresh Mentha piperita* (Peppermint) leaves 3%. Also contains microcrystalline cellulose and hydrated cottonseed oil. Store below 25ºc and out of direct sunlight. 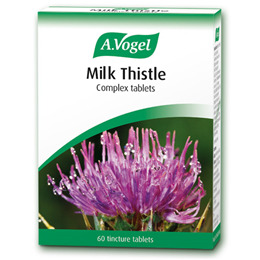 Below are reviews of A Vogel Milk Thistle Complex Tablets - 60 Tablets by bodykind customers. If you have tried this product we'd love to hear what you think so please leave a review. Delivered in time stated, very pleased with product. Delivered on time, excellent product. I've taken milk thistle for years and always from bodykind as the service is great. I eat late at night and taking milk thistle seams to prevent heartburn / indigestion when sleeping. Always stock this around the holidays when rich food and drink play havoc with my old liver!